Essential mathematical tools for the study of modern quantumtheory. 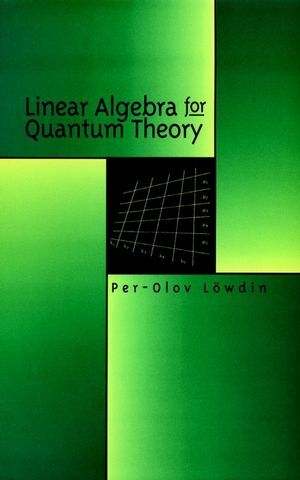 Linear Algebra for Quantum Theory offers an excellent survey ofthose aspects of set theory and the theory of linear spaces andtheir mappings that are indispensable to the study of quantumtheory. Unlike more conventional treatments, this text postponesits discussion of the binary product concept until later chapters,thus allowing many important properties of the mappings to bederived without it. The book begins with a thorough exploration of set theoryfundamentals, including mappings, cardinalities of sets, andarithmetic and theory of complex numbers. Next is an introductionto linear spaces, with coverage of linear operators, eigenvalue andthe stability problem of linear operators, and matrices withspecial properties. Material on binary product spaces features self-adjoint operatorsin a space of indefinite metric, binary product spaces with apositive definite metric, properties of the Hilbert space, andmore. The final section is devoted to axioms of quantum theoryformulated as trace algebra. Throughout, chapter-end problem setshelp reinforce absorption of the material while letting readerstest their problem-solving skills. Ideal for advanced undergraduate and graduate students intheoretical and computational chemistry and physics, Linear Algebrafor Quantum Theory provides the mathematical means necessary toaccess and understand the complex world of quantum theory. PER-OLOV LÖWDIN, PhD, is a professor emeritus at theDepartment of Quantum Chemistry, Uppsala University, Uppsala,Sweden, and Graduate Research Professor Emeritus at the QuantumTheory Project, Department of Chemistry and Physics, University ofFlorida, Gainesville, Florida. He is Editor-in-Chief of Wiley'sInternational Journal of Quantum Mechanics. Axioms of Quantum Theory Formulated as a Trace Algebra. Provides in an easily-accessible format, essential mathematical tools for the study of modern quantum theory. Unlike conventional treatments, this text postpones discussion of binary product concept until later chapters, thus allowing many important properties of the mappings to be derived without it.